United Airlines has annouced it is replacing the hefty flight manuals and chart books its pilots have long used with 11,000 iPads carrying the same data. The 1.5 pound iPad will replace 38 pounds of paper instructions, data and charts pilots have long used to help guide them, parent company United Continental Holdings said. The iPads will be pre-installed with the Mobile FliteDeck software app from Jeppesen, a Boeing subsidiary which provides navigation tools for air, sea and land. And on long international flights the pilots could also practice their landings by playing Firemint's Flight Control. 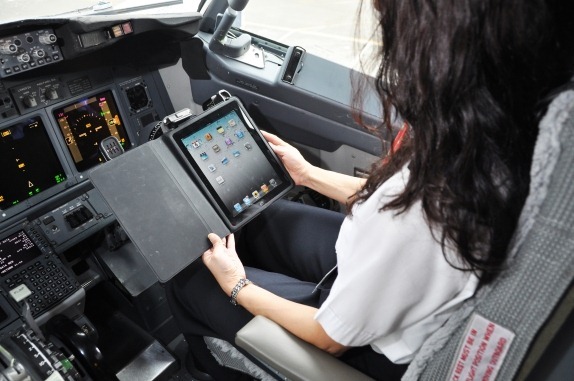 iPads will be supplied to all pilots on United and Continental flights; the two carriers merged in 2010. United estimates that using the iPad will save 16 million sheets of paper a year, and that the lighter load it represents will save 326,000 gallons (1.2 million liters) in fuel. Contact NYC Web Design today for a free quote on your iPad app.